​The price for most of the programmes within this sector will be dependent on the number of students and the format of the event. By providing some additional information, a quote can be put together for you with an outline of the event and the cost. These days are designed as one-day business simulation exercises. The days can be adapted to your timetable and some can be run as a morning session. All the days focus on introducing students to some of the basic functions of running a business; finance, marketing, personnel and operations. Students work in teams and get the opportunity to practice those all important transferrable skills; team work, leadership, creative thinking, problem solving, time management, presentation and communication. All the projects are run with Business Facilitators who come in to support and work with the students; these are professionals from local business who are able to share their business knowledge and expertise. Students work together to form a music management company. They put together a playlist for a band based on their target audience, design a logo for them, put together a concert and design merchandise. At the end they pitch their proposal to see who wins management of the band. This is a really fun day which introduces students to the concept that the music industry is a business just like any other and even if they chose, for example, accounting as their career, they could still go into an industry which excites them like music or football. Working in teams, students come up with an educational toy they can make out of 'bits' - plastic bottles, wooden wheels, tubes, dowels, paper clips, elastic bands, paper plates, boxes, cardboard - anything can be in the box! They then design and manufacture their toy. ​They then have to work out the costs of the toy, set a selling price and produce marketing materials for their toy. Using the 4Ps; product, price, place and promotion, they put a pitch forward to a panel of Business Ambassadors to see if they can win a buyer. ​Students all take a picture out of the bag. They then have to come up with a business related idea. Working through the process, the identify a target market, put together a marketing campaign and strategy using the 4Ps and present it back to the Business Ambassadors . ​This challenge can be completed in a morning sessions (4 x 50 minutes). Working together students form a business to produce a soap. They put together up to 3 essential oils which they like the smell of together (they are give a rack of test tubes with the essential oils in) and which have the properties to best appeal to their identified target audience. They then look at other ingredients they can add to make their soap more appealing. Once designed, they come up with a marketing campaign, logo and packaging. They present at the end to a panel of Business Ambassadors to decide on the winning soap. Costs: Dependent on groups sizes, challenge and length of challenge. Venue: Hall for introduction. Hall/Classrooms. Hall for final presentations. ​A fantastic opportunity for pupils to have fun solving a series of puzzles and maths problems. Designed by the Liverpool Mathematical Society, there are sets to designed to suit all different age groups. Each session runs for around an 50 mins/hour (depending on the school day) with groups of up to 75 pupils. Pupils work in pairs to solve the problem which is checked by a teacher or business ambassador (using an answer sheet) before they move onto the next puzzle. This is a great event for increasing confidence in pupils and making maths fun. Costs: £500 - £750 for a full day (5 - 6 sessions) depending on numbers and distance. The aim of a STEM day is to introduce students to different jobs and industries within the STEM sector. 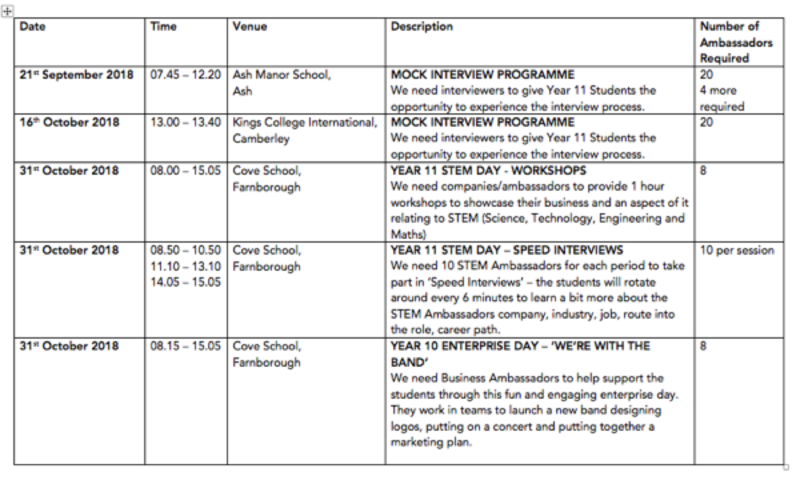 They will get to meet and interact with ambassadors from colleges, universities and business and learn more about possible pathways and how studying STEM subjects can take them onto lots of different and exciting career opportunities. The day can be designed around your school day and room availability. Ed2Biz will organise for a number of volunteers to come into the school to deliver hands-on/interactive workshops on a range of STEM related activities that showcase an area of their organisation or industry. Students work in groups and rotate around each of the activities. The length of the activities, size of the groups and numbers of rotations will be agreed prior to the day being booked. During the consultation period, we can share with you different ways that it can be done and what works well to make sure you get a day that has the very best outcomes for your students and help to raise aspirations and motivation levels. Do you want to inspire your students? Introduce them to some different careers|? Give them an opportunity to ask business professionals questions about what they do and what their working day looks like? Organised to fit in with your school day, speakers will be briefed on the format of their talk and timings leaving plenty of time for questions at the end. This can be a traditional Careers Fair where we invite lots of businesses to come in and run stands and the students can visit the stands and talk to the Business Ambassadors. We will work with you to organise the day to suit your students get a range of different business and industry sectors to come to your school. We can also organise a more structured day where businesses/colleges/universities come in and deliver short hands on/interactive activities with groups of students on a rotational basis. An opportunity for students to practice their interview skills. Working with the school to agree the format, Business Ambassadors will be recruited to interview the students either on a one-to-one basis or in small groups. Business Ambassadors can be recruited from relevant sectors to support anything from CV workshops to understanding more about different transferrable skills necessary to be successful in the world of work. Organised throughout the year, these are opportunities for students to work alongside engineering professionals to complete engineering challenges in teams.